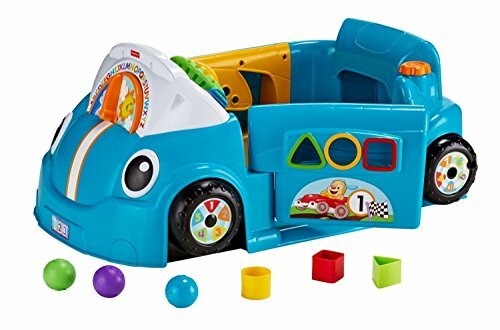 Fisher-Price Laugh & Learn Smart Stages Crawl Around Car puts baby in the driver's seat of a stationary car that comes fully loaded, inside and out, with grow-with-me options for learning and play! The interactive lights and sounds dashboard keeps baby busy with a light-up baby "GPS", a horn to honk, gears to shift, and more! Three Smart Stages levels of play, over 75 sung songs, tunes and phrases, and lots of physical activities that grow with baby from sit & play, to crawl, to stand & cruise help fuel physical development, interactive learning fun, and imaginative adventures. (Please note: Car is stationary.) Crawl Around Car comes equipped with Smart Stages technology, an exciting new way to change learning content as baby grows. Every baby develops at their own pace, and Smart Stages technology gives you the ability to select the stage that's best for your child. There are a variety of developmentally appropriate songs, phrases and sounds within three levels of play - just slide the switch! Smart Stages Technology: Level 1 - Explore - 6M+ First words and sounds spark baby's curiosity; Level 2 - Encourage - 12M+ Prompt baby though questions and simple directions; Level 3 - Pretend - 18M+ Imaginative fun and early role play.